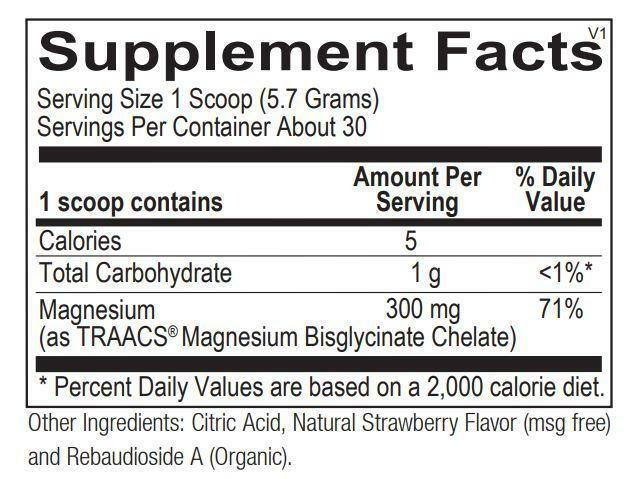 Reacted Magnesium Powder delivers 300 mg magnesium bisglycinate chelate in a delicious, strawberry-lemonade flavored mix that can be added to any beverage. 30 servings. Magnesium is a mineral used by every organ in the body, especially the heart, muscles, and kidneys. By some estimates, up to 80 percent of Americans are not getting enough of this key mineral. 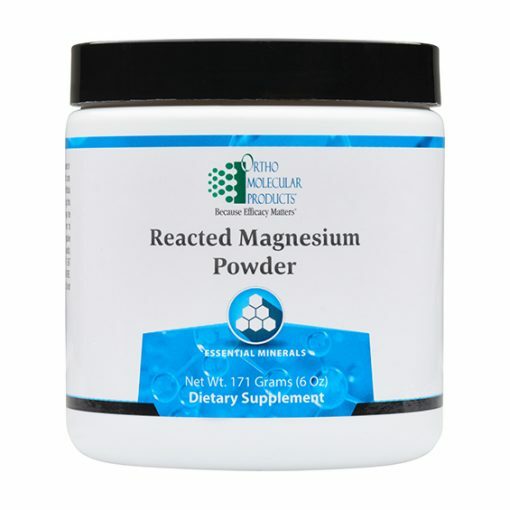 Magnesium insufficiency has been implicated in a wide range of health challenges. 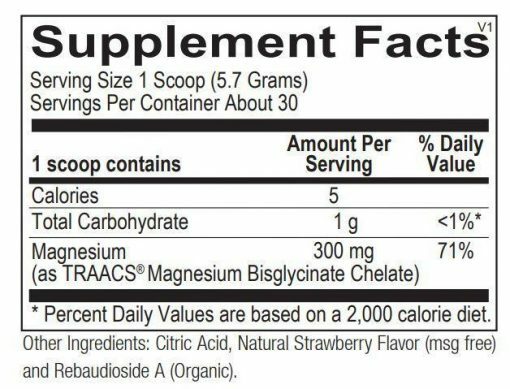 Reacted Magnesium Powder delivers 300 mg magnesium bisglycinate chelate in a delicious, strawberry-lemonade flavored mix that can be added to any beverage. 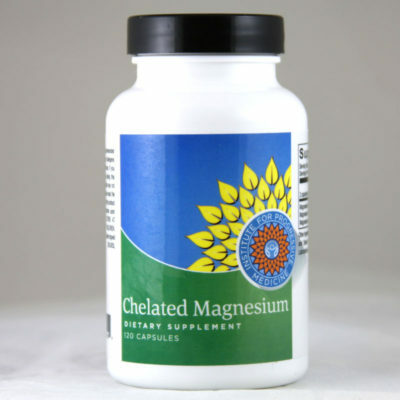 Magnesium bisglycinate was chosen for its proven enhanced absorption. In addition, the chelated form of magnesium bisglycinate used in this formula is gentle on the stomach. Research has demonstrated this form to be well-tolerated, causing less laxation potential than other forms of magnesium, such as oxide. Mix 1 scoop (5.7 grams) of Reacted Magnesium Powder with water or the beverage of your choice once daily or as recommended by your health care professional. Studies to date have found that magnesium supplementation maintains healthy blood pressure levels. 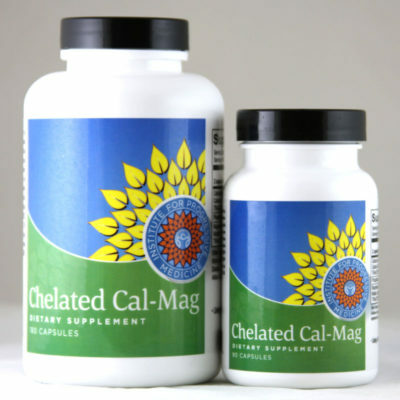 Calcium is essential to the contraction of muscles, while magnesium aids muscle relaxation. Insufficient magnesium levels can contribute to constriction of the muscles in blood vessels and trigger changes in blood pressure levels. Several prospective studies have examined associations between magnesium intake and heart health. A systematic review and meta-analysis of prospective studies found that higher serum levels of magnesium were significantly associated with enhanced heart health and optimized blood flow to the heart. Magnesium is integral for the transport of insulin from the bloodstream to cells. Increasing magnesium levels has been shown to maintain normal blood sugar levels. Diets with higher amounts of magnesium are associated with blood sugar balance, due to the role of magnesium in glucose metabolism. Most investigations of magnesium intake and insulin balance have been prospective cohort studies. A meta-analysis of seven of these studies, which included 286,668 patients, found that a 100 mg/day increase in total magnesium intake promoted insulin balance by a statistically significant 15%. Another meta-analysis of eight prospective cohort studies that followed 271,869 men and women for an extended period of time found a significant association between magnesium intake from food and insulin balance. Magnesium is involved in bone formation and influences the activity of osteoblasts and osteoclasts, cells responsible for the breakdown and formation of bone. 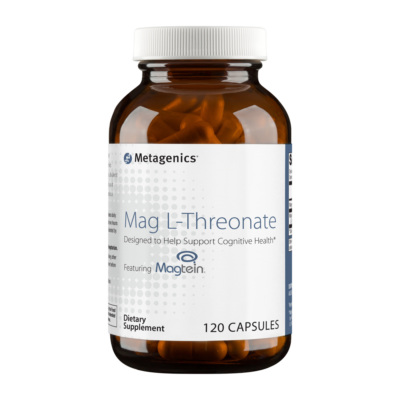 Magnesium also impacts concentrations of parathyroid hormone and the active form of vitamin D, which are major regulators of bone homeostasis. Several population-based studies have found positive associations between magnesium intake and the state of bone strength and mineralization in men and women.